Learn the actions and procedures of Craps play in a casino, from getting your chips to throwing the dice. In a casino, bets are made using chips and you'll have to convert your cash to the casino's chips to play. You can do this at the cashiers desk or you can throw your money down on a Craps table and ask for them by yelling out "change!". If you get your chips at the table, be sure to throw your money down at an appropriate time and not when the shooter is about to throw the dice. Remember, when taking your place at a table don't push or barge your way in. Politely find a table and a space. Once you've got your chips there is a groove around the table's outside rail for you to place and store them. Underneath you'll find a shelf to put your drink. 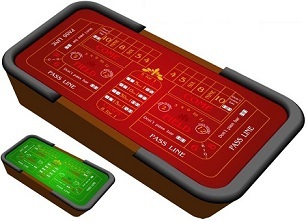 You place your chips on the table's layout and it is clearly marked and divided into sections for the different bets (see Craps instructions for a guide). The casino employees running the table, known as the crew, place some of the bets for you. The crew at a Craps table is made up of two dealers, a stickman and a boxman. A pit boss will supervise an area containing a number of tables known as a pit. The boxman sits at the centre of the table opposite the stickman and supervises play. He makes sure there is no cheating, payoffs are correct and keeps an eye on the chips set out on the table in front of him. Two dealers stand either side of the boxman and they control play on their side of the table. They make payoffs on winning bets and collect on losing ones. If you want to make Free Odds, Place, or Lay bets you give your chips to the dealer and they make the bet for you. The stickman stands at the centre of the table opposite the Boxman. He calls out the numbers thrown and handles the dice with a long stick curved at the end. Proposition bets (the bets in the table's centre) are made and paid by the stickman. To track the progress of a game the stickman will move a small plastic disk known as the marker puck. Once the shooter has established a point number the dealer will move the marker puck onto the appropriate number on the layout to indicate what it is. These numbers are in boxes (4, 5, 6, 8, 9 and 10 - known as Box Numbers) on the far side of the layout. The puck is turned white side up to indicate a round is in progress and turned black side up, and moved to the Don't Come section on the layout, once the shooter makes his point or sevens out. Once the shooter sevens out the dice pass to the next player in a clockwise direction. Players may decline to shoot the dice and let the next player take their turn shooting. When shooting the dice you don't want them to skip across the length of the table, possibly knocking over the chips placed on the layout, and you don't want them to fly over the top end of the table either. A long, strong throw towards the backrail is what's wanted. The stickman will push the dice back to the shooter's end for the next roll. The shooter may ask to exchange the dice for a new set at any time. The crew will present a bowl of casino dice and you may choose any you wish to shoot with. To learn more about casino playing procedure in a Craps game (like rules for cocked dice, etc) see casino dice procedure. Once you've mastered the basics and you're comfortable playing at a casino Craps table you can learn about all the other bets available. Choose from instructions from a real casino or dice-play's Craps guide.